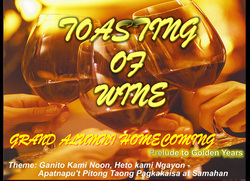 My Multimedia Team Projects - “You must love designing for a living"
This slide is shown whenever the EMCEE talks about the alumni homecoming ,the batch 2001, also when no games, intermission is on going. 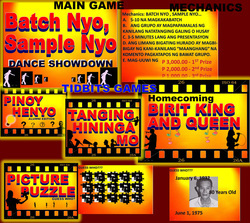 The design was created from my favorite free photo editor Fireworks 8 made by Macromedia, Inc. I decided to make the caption look gold since the sub caption states prelude to Golden Years. This was my first time to do the task , aside from small presentations in IBICCI. Anyway, it was a great start for many tasks like this in the future. Like most of the TV programs, the event projected the sponsors, either minor or major sponsors to show their gratitude.The slides shows the names with fireworks background. 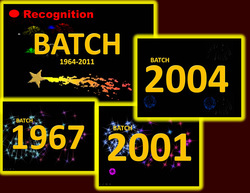 To recognize each batch who attended during that night, slides with fireworks at background shows the year they belong. I encountered stress in making this slides because of the number of slides(from 1964 to 2011). 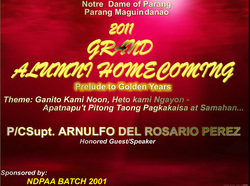 Furthermore, the design was derived from the program of ABS CBN, Showtime. Are you familiar with the show of Korina Sanchez-Rojas? 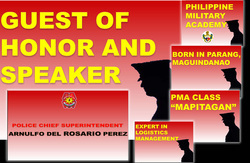 Not the Balitang K. If "yeah", then the introduction of the guest speaker of that night, Chief Superintendent Arnulfu Del Rosario Perez was great(hehe, since it was Rated K Style ). While reading the background of the guest, the phrase is flashing into the BIG SCREEN. Even my self was amazed with the IDEA. Thanks to Sir Bong. Unfortunately, a technical and programme error cancel the beauty of it.